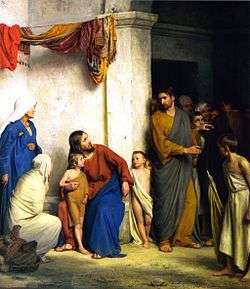 The Little Children was a saying given by Jesus in the New Testament. 22. Jesus saw some babies nursing. He said to his disciples, "These nursing babies are like those who enter the (Father's) kingdom." They said to him, "Then shall we enter the (Father's) kingdom as babies?" Jesus said to them, "When you make the two into one, and when you make the inner like the outer and the outer like the inner, and the upper like the lower, and when you make male and female into a single one, so that the male will not be male nor the female be female, when you make eyes in place of an eye, a hand in place of a hand, a foot in place of a foot, an image in place of an image, then you will enter [the kingdom]." The Kingdom of Heaven is compared to little children at several other places in the New Testament. This article is issued from Wikipedia - version of the 4/12/2013. The text is available under the Creative Commons Attribution/Share Alike but additional terms may apply for the media files.